How to open a shared, read-only MS Word document in MS Word inside of the application upon clicking a command button? 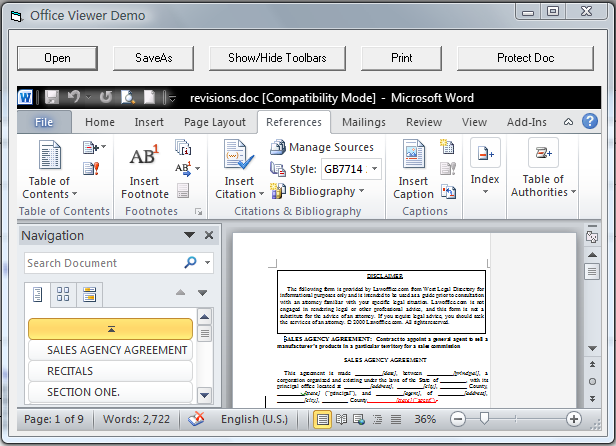 The component supports seamless integration with Office 97, Office 2000, Office 2003, Office 2007 and Office 2010. Edraw Office Viewer Component supports embedding Office documents in your application by implementing a full featured ActiveX document container. Now you can create, open, edit, view and save office documents such as *.doc, *.docx, *.xls, *.xlsx, *.ppt, *.pptx etc in the web page. With Office component you can have Office run embedded inside your custom solution. 2. Select control "Edraw Office Viewer Component Module" in the controls table. 4. The control will now appear in your toolbox. 5. Drag and drop the control on your form. 6. Right click the control then choose the View Code item. 7. Add the NotifyCtrlReady event and set the library file to load.